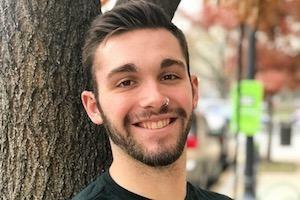 Sam Fromkin (BA musical theatre and Spanish ’19) has received an Arthur Ashe Jr. Sports Scholar Award for his academic excellence, athletic accomplishments, and leadership initiatives during his time at American University. Fromkin has a 3.75 GPA, swims on AU’s NCAA Division I team, and serves as founder and president of AU’s Athlete Ally chapter, which dedicates itself to creating LGBTQ+ inclusive athletic environments. The Arthur Ashe Jr. Sports Scholar Award is inspired by tennis legend Arthur Ashe, Jr.'s commitment to education and love for the game of tennis. The online media organization Diverse: Issues In Higher Education sponsors the award to honor undergraduate students who have excelled in the classroom and on the athletic field. Arthur Ashe Jr. Sports Scholars must also demonstrate a commitment to community service and student leadership. In addition to maintaining a 3.75 GPA with a double musical theatre and Spanish major, Fromkin has appeared in seven American University theatre productions, one per semester. When he first arrived at AU, he appeared in the New Student Showcase, directed by Caleen Jennings. He also appeared in No, No, Nanette directed by Karl Kippola; A Funny Thing Happened on the Way to the Forum, directed by Cara Gabriel; Argonautika, directed by Isaiah Wooden; What Goes Around, directed by Menninger; and Pippin, directed by Wooden. He is currently appearing in the role of Billy in Carrie: The Musical, directed by Menninger. As an NCAA Division I Swimmer on the American University team for four years, Fromkin swims backstroke and IM plus relays and butterfly. During swim season, he practices nine times a week—for a total of 20 hours a week. One of Fromkin’s most proud accomplishments is founding an American University chapter of Athlete Ally, which works to end the homophobia and transphobia in sport and to activate the athletic community to exercise their leadership to champion LGBTQ+ equality. Fromkin also serves as president of the chapter. “Being a student-athlete is tough, so we want to be able to connect with people who are also athletes and part of the LGBTQ+ community or an ally to find a sense of community in the athletic department,” he added. Fromkin is pushing for awareness in the athletic departments, meeting with captains of sports teams, and planning events like an upcoming yoga day at AU this spring. After graduation next month, Fromkin will take a birthright trip, a 10-day heritage trip to Israel for young adults of Jewish heritage. He took his first birthright trip last year. This time, he will be leading it. Afterwards, Fromkin plans on staying in the DC area to pursue a career in acting, but he also plans to keep swimming as a part of his life.